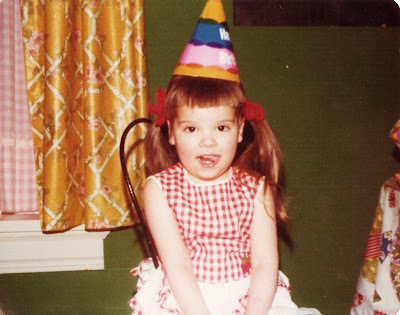 This is me, on my third birthday (35 years ago today), wearing my favorite frilly strawberry dress. I remember those chintz curtains my mother made and that I loved the pink gingham inner curtains. I thought the grass green walls were beautiful and just after they were painted, I licked a stamp and stuck it to the wall on the stair landing to help make the wall prettier. I was sitting in a iron chair that was part of a Victorian ice cream set my parents had picked up on a trip to Bar Harbor (this house was in Ohio). I know I'm feeling saucy but bashful in my party dress and having my picture taken made me feel shy, thus the goofy tongue. It was that dress, though, that I loved most of all. It had gingham trimmed layers of ruffles that went to my knees, buttons up the back and best of all, there was an applique of two bright red strawberries at the waist. I would dance in my lacey anklet socks and spin and spin to see that dress twirl out, all full and flouncy. I adored that dress. I remember trying to fit into it up until age five and one day it simply didn't fit anymore. I still have the dress, packed away, just a keepsake from when I was three. happy birthday to you. have a wonderful day!. Happy Birthday Amy, I hope your day is filled with peace, joy, love, family and laughter! I also have fond memories of some of my dresses. mmmmm... what a rich memory. Here's to twirling and swirling strawberry dresses.